It’s big news when any business endeavor comes to this rural part of Vermont. After all, most residents are hungry for economic development, jobs and the increased revenue that can accompany a viable business. In this economically depressed area, one recent and promising development is Stable Connections. 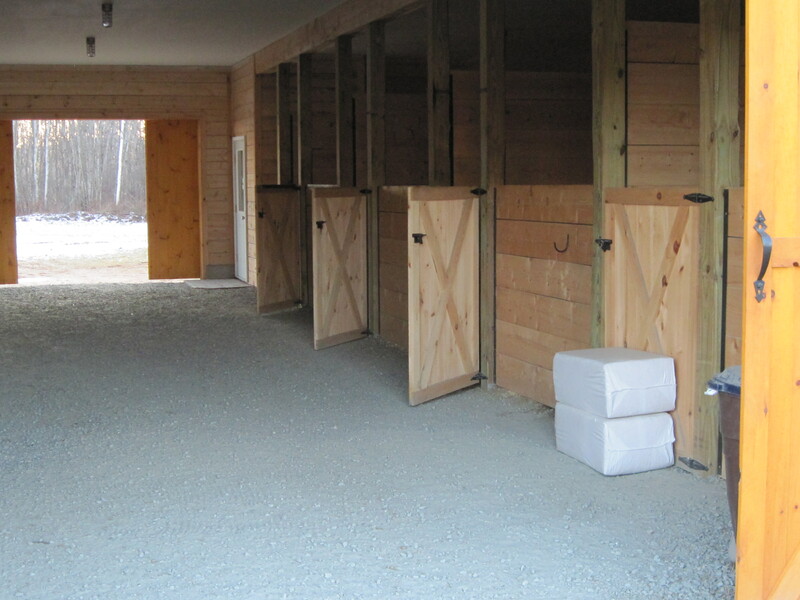 It’s a fledgling equine therapy program now located just south of the Klinefelter property on Route 102. Founder and manager Karen Guile is building this intriguing business slowly, steadily and modestly. She already has numerous concrete accomplishments under her belt. 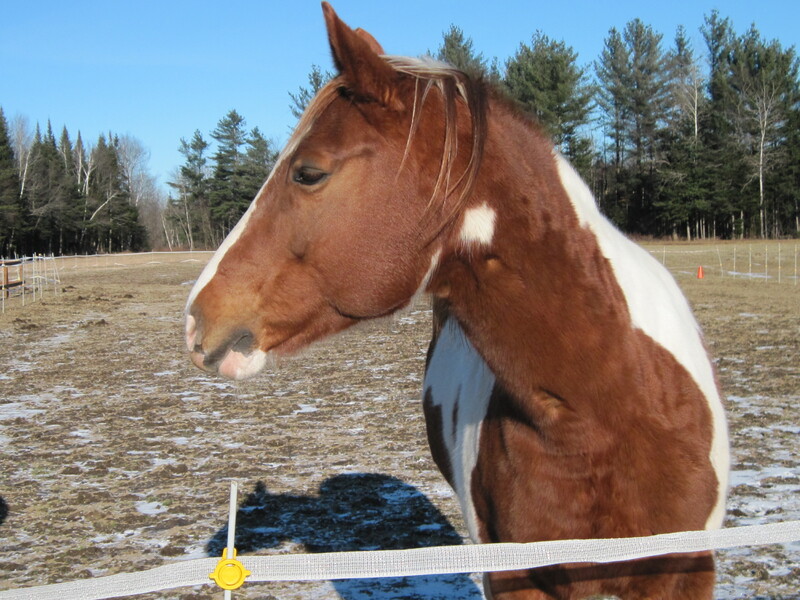 Stable Connections has land, approved zoning permits on file at the Town Office, a newly constructed barn-office, four beautiful horses, clients, private grant money from the Tillotson Foundation for program expenses, working solar panels, and much more in the pipeline. Her business is in the baby stages, but it’s for real. Stable Connections. 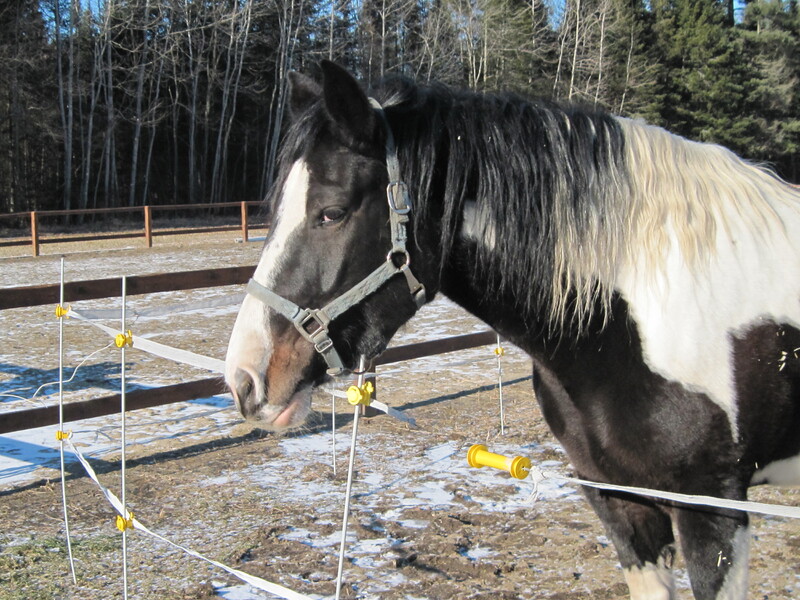 It’s a catchy, clever play on words and ideas, invoking the role that horses can play in fostering self-confidence, stability and balance in human lives. 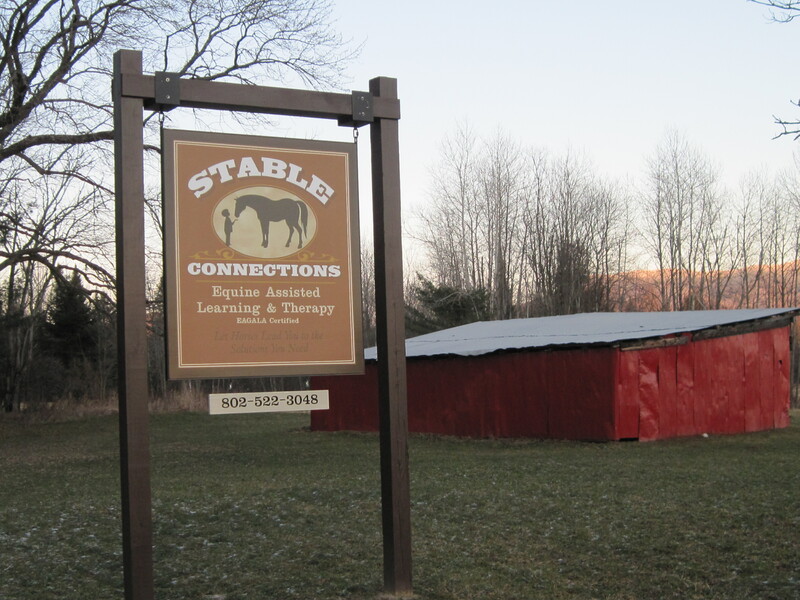 Stable Connections is the only EAGALA-certified equine therapy program in Vermont and New Hampshire, a groundbreaking endeavor in itself. I confess when I first learned of the plans for an equine therapy program, I was somewhat skeptical, wondering how such a business/program could be viable in these rural parts. Worthy as the program is, surely a better place for it might be the outskirts of Brattleboro, Montpelier or Burlington? But although Stable Connections is still new and has yet to prove its full economic chops, I’m now cautiously optimistic that it will prosper and benefit our region. Last summer, Stable Connections hosted its Grand Opening, garnered some decent publicity and is slowly but steadily building a client base and revenue stream. Clients range from private autistic youth to social workers and guidance counselors, and groups of at-risk youth. Guile has longer term plans for couples counseling, corporate and non-profit team-building retreats, and training for other human service professionals. She’s also in the process of negotiating a contract with the court diversion program for Caledonia, Essex and Orleans counties, whereby first-time non-violent and youthful offenders can fulfill their counseling and community service requirements at Stable Connections. It’s an exciting and innovative program, a great example of using some of the resources of the working landscape to diversify the local economy and give back. When asked how she thinks Stable Connections will contribute or enrich the community, Guile is honest and realistic. Although it will be a while before her business will generate jobs, Guile believes that Stable Connections has the potential to generate significant ancillary revenue. For example, she foresees hosting increasingly large groups at the facility, which can in turn lead to increased revenue for local restaurants, hotels and even limousine services. Stable Connections has its origins in a dream held and patiently nurtured over time by Karen (Peaslee) Guile. Karen is the oldest daughter of Bert Peaslee, the now-legendary town official and proprietor of Peaslee’s Vermont Potatoes. 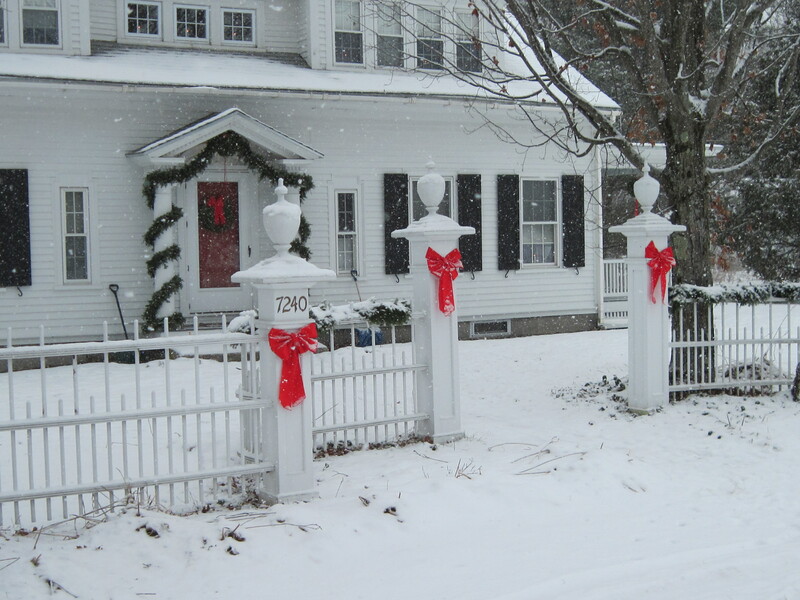 Although Mr. Peaslee died of pancreatic cancer in 1999, he is still well-known and fondly remembered in much of Essex County and neighboring New Hampshire. Karen, one of four surviving Peaslee children, was reportedly the kid who loved horses. From the age of 5 or 6, she recalls, she adored horses and truth be told, was a little obsessed with them. As she grew into adulthood, she saw in them the potential for companionship and healing. Early on, as she describes it, she knew her fate and future were linked to these animals she loved best. It took Karen a while to be ready to launch her dream. Education, work, marriage and her son all demanded her time and attention. But by 2009, she began marshalling her resources. 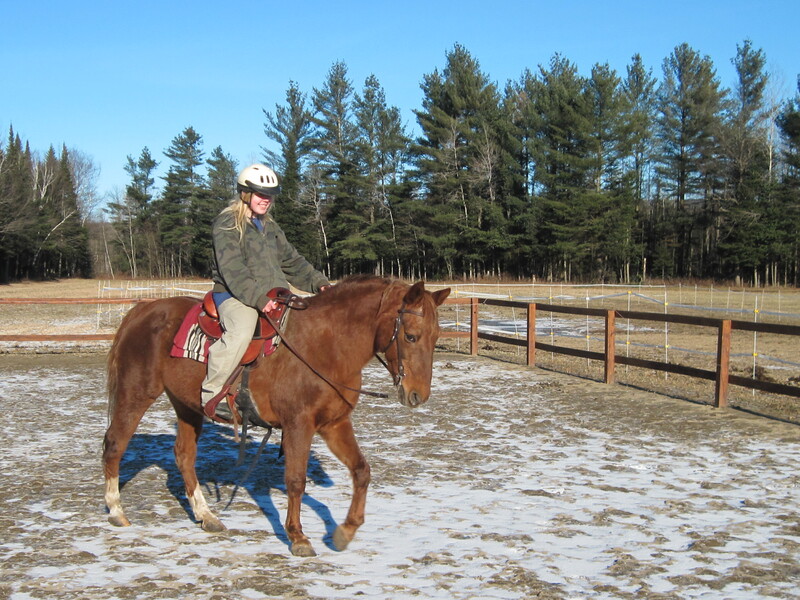 She has an associate’s degree in physical therapy, studied special education and psychology at Lyndon State College, and has worked in hospitals, volunteered as an EMT-B and owned/ managed various businesses. 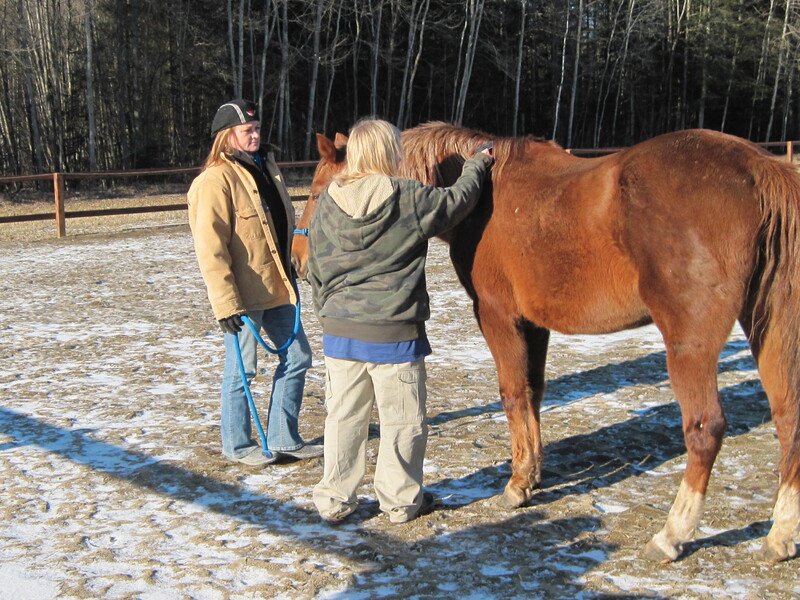 With this background, she began and successfully completed the training to become a certified equine therapy instructor. For more information about EAGALA-certified programs and instructors, visit this website. Both sentimental and practical reasons brought Karen back to Guildhall to launch her project. Her mom (Representative Janice Peaslee), her sister Barbara, and the family farm where she’d grown up, were all here. And in very practical terms, she had a small piece of land waiting for her in Guildhall, well-suited to her plan. Her dad Bert Peaslee had long intended each of his four surviving children to have a share of the Peaslee land holdings. “He wanted all of us to have a portion of the land as our legacy and heritage,” says Karen. Bert’s widow Janice Peaslee and Sharon Peaslee DeCicco, (one of Karen’s younger sisters) confirm that the 140 acre parcel known as the old Deering Meadow, had long been intended for Karen, just as other parcels scattered across Guildhall and Maidstone were intended for other siblings. The parcel of land on which Stable Connections now sits continues to function as a working part of Peaslee farm operations, except that a 4-5 acre portion of it has been taken out of current use and is devoted to Stable Connections’ barn and horse training area. This enables the lion’s share of the parcel to continue being farmed and managed the way it has for generations. Karen wouldn’t have it any other way. During numerous interviews, she made it clear that her first priority is the health and economic viability of the farm—hence her decision to carefully limit the scope of Stable Connections’ development on this parcel. Her first order of business was to construct a barn-stable. 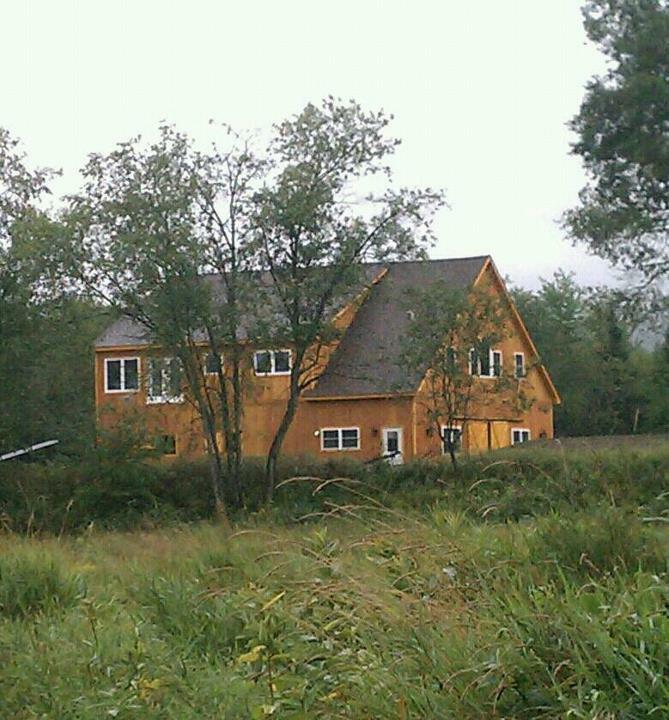 After generating a business plan, demonstrating evidence of her own capital investment in the project, and undergoing a grueling application process, she secured financing for barn construction from the Vermont Agricultural Credit Corporation and North Country Investment Corporation, non-profit lending agencies. One particularly notable dimension of Stable Connections is its business model. Karen has chosen to proceed modestly. Her dreams may be grand, but there’s nothing grandiose or naïve about the execution. In short, she hasn’t bit off more than she can chew. Thanks to her loan financing, the horse stables are complete, as is the indoor plumbing and a small office on the ground floor. The upstairs, intended as more habitable living and program quarters, remains partially unfinished, until Karen can generate more clients and more capital. She works three days a week in a separate job to bring in a steady income. She’s taking it slowly and operating within her means. Her goal is to keep a tight lid on expenses and debt while she grows—slowly. 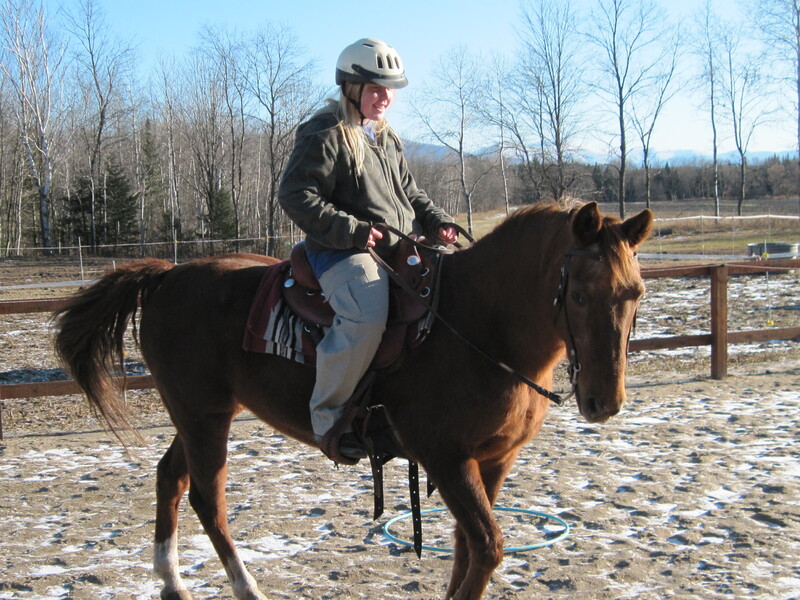 The day I was there, Sabrina was, in addition to caring for the horses, getting a therapeutic riding lesson. When she got up on the horse, it was obviously less about managing the horse, than managing herself. 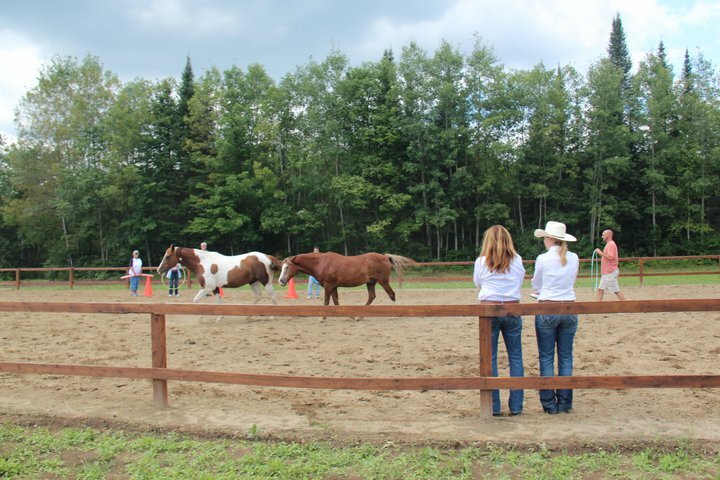 For example, Karen repeatedly called out instructions to Sabrina, not the typical ones you might hear from a riding instructor, but rather simple tasks like “hold out your arms to the side.” “Look up at the sky.” “Put your palms forward.” “Eyes forward, always look ahead” The instructions given were clearly designed to help Sabrina find a sense of balance and confidence. In response, Karen has persisted in telling Sabrina, time and after time, that it’s okay to admit something is hard. But the next sentence, Karen insists, has to be: “but I can do it.” That could be the motto of Karen Guile and Stable Connections, as she returns to Guildhall and builds a dream. It’s hard, but you can do it. 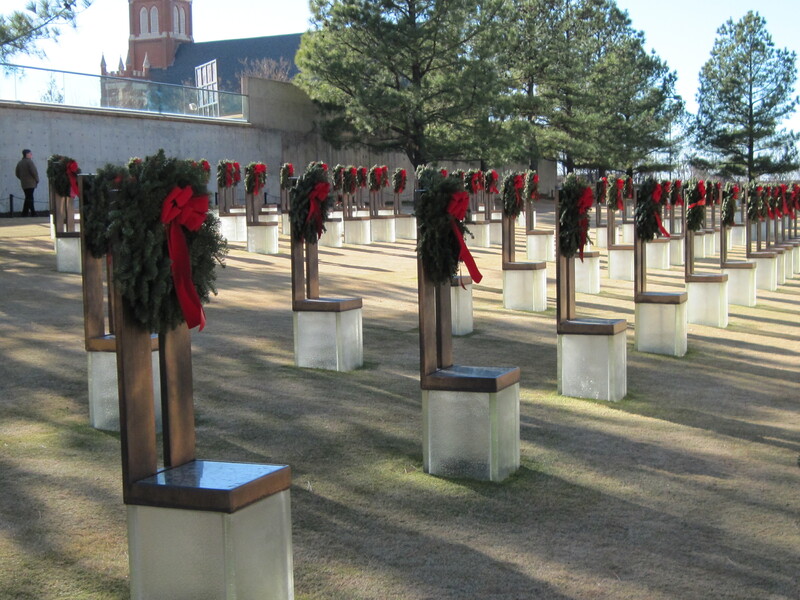 January: Edward and I started the New Year in Oklahoma City,of all places! My mother has a house there now with her partner David, and I hadn’t yet seen her new digs. My brother and his girlfriend Gina flew in from Eugene, Oregon. In short, we converged from all over the country, had great food, drink, conversation and music, and explored OK City and the environs. Outside the museum. A moving spot indeed. Most notably, we visited the site of the bombing of the Alfred P. Murrah federal building in 1995, a place I’ve wanted to go for a long time. (I highly recommend this living museum. Not an easy museum to make one’s way through, but I’m very glad I did. Here’s the link to the museum. January and February were bittersweet months. In January, the law firm where I’d spent most of my law clerkship underwent a major change. My two mentors, Dave Sleigh and Dave Williams parted company. For over three years, I’d had the good fortune to work at this remarkable firm and get unprecedented exposure to the hard realities of law practice. In retrospect, their breakup appears to have been for the best, and I have maintained a great relationship with both of them, but those initial weeks were a sad time: this extraordinary and near-legendary Vermont law partnership had come to an end. I was lucky to have been a part of it, but now it was over and we all somehow had to move on. I’d been planning to stop working by April 1 to start bar exam study; with the change, I adjusted my study plans and decided to plunge in a bit earlier. I was sad about something wonderful coming to an end, but looked forward to a new chapter in my life and career. February: I began bar exam study. From February through mid-April, I studied approximately 3-5 hours a day. The rest of the time, I worked on various law research and writing projects for Dave Williams, to complete the last leg of my clerkship requirements. In February, I took an online MBE immersion course, and I designed a program of study leading up to May, when the study would then become truly high-powered and ultra-structured. 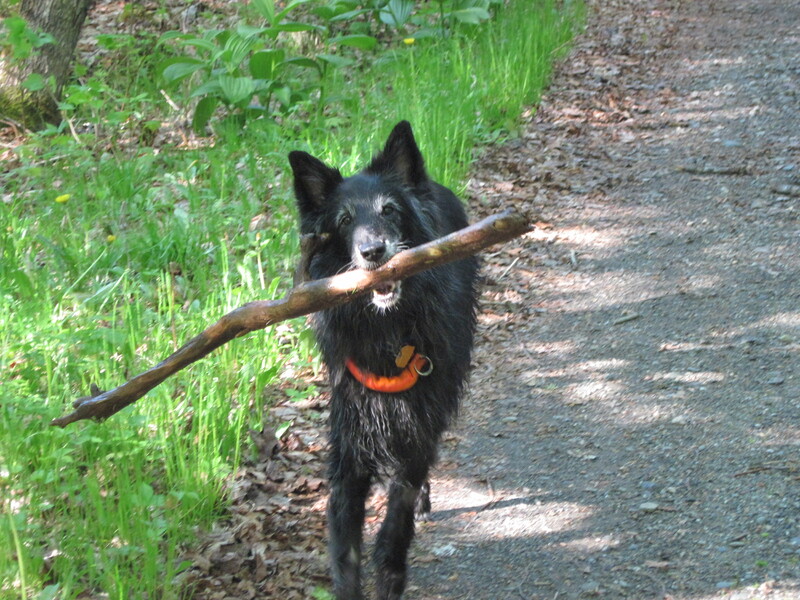 March: Our beautiful Belgian sheepdog Simone de Beauvoir passed away on March 28. She was just a few months shy of her 14th birthday. This was a devastating loss to us, but I confess it was also something of a relief. During the last month or so, her health was severely compromised; when her time finally came, I felt glad that her suffering was over. She was a unique dog, so elegant and refined. And she was the first dog I’d ever had as an adult. Happy hunting grounds, darling Simone! April: I spent the first two weeks of April as defense counsel trial assistant for Dave Williams on a federal conspiracy trial in Burlington. It was amazing! I learned an astonishing amount and had the opportunity to do many new things (such as draft defense counsel jury instructions!) 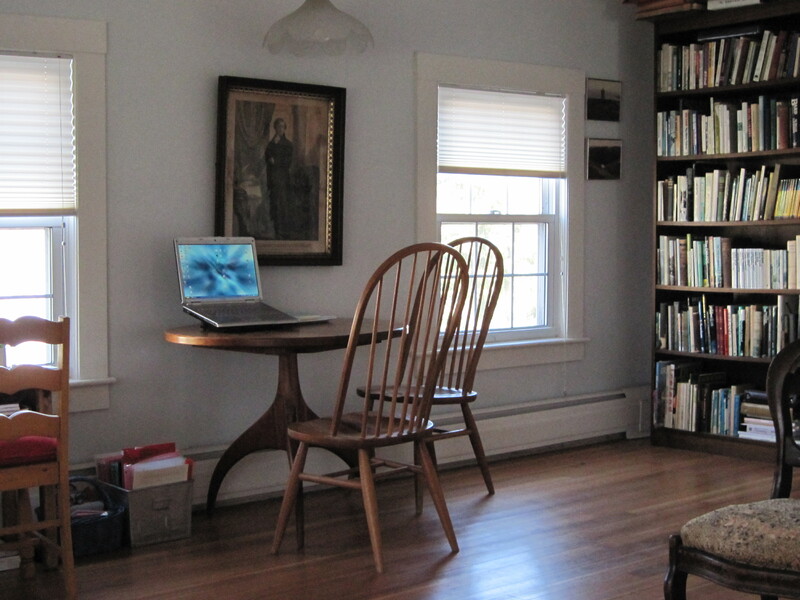 (Many thanks to Tim and Leslie Nulty for letting me stay at their beautiful home in Jericho during much of the trial). Once it was over, I elbowed almost everything else out of my life so I could study for the bar exam. May: On May 15, I turned in my final law office clerkship report to the Vermont Board of Bar Examiners and Supreme Court, hence “graduating” from Vermont’s unique four year alternative to law school. One of many milestones to come during 2011! After months of spending hours each day perched in front of a laptop or with my nose in a book, I developed some serious neck and shoulder pain. I had many despairing days of panic as I wondered how I could possibly prepare effectively for the bar exam with such excruciating pain. Thank goodness for the great physical therapist Stacy Hicks, of the Carlisle Place, who put me on a strict program of exercise and instructed me on exactly how to sit when I studied. Because by this time, I was studying 7 hours per day. Thankfully, after about two weeks on the regimen, the pain cleared up completely. At the end of May, I had the honor of being appointed by Governor Peter Shumlin to a three year term as Act 250 Commissioner for District 7, which covers the Northeast Kingdom counties of Caledonia, Essex and Orleans. For those non-Vermonters among you, Act 250 is the mechanism by which Vermont regulates development. For each district, there are a group of citizen-commissioners who act in a quasi-judicial role to mitigate the environmental costs of development. Act 250 was passed in the 1970s and in sum, is pretty much the reason why Vermont retains much of its beauty and has avoided blight. Under Act 250, Commissioners employ the now-famous 10 criteria to rule on development projects. In my politically conservative corner of Vermont, Act 250 has taken a lot of heat. But the reality is that in a rural state which must strike a balance between much-needed economic development and environmental concerns, Act 250 is beneficial to both would be developers and the environmentalists. It provides a clear and consistent framework and guidelines for responsible development. For more information on Act 250, visit the Natural Resources Board website. One of my law study corners. When not here, I was at Weeks Memorial Library in Lancaster. June and July: these months were a blur. I really cannot remember much during this period, except that I studied like a madwoman. In the last two weeks before the exam, I had a couple of hours-long meltdowns, but I easily could have had more, so I count myself lucky. During all of June and July, I was on a strict regimen of study, starting at 8:30am each morning, a half hour break for lunch and a short walk, then study until dinner time, then another quick walk, and then another hour of study. I took the Vermont Bar Exam on July 26 and 27 in Montpelier, Vermont, at the Capitol Plaza Hotel. August: After the bar exam, I allowed myself one and a half days of complete rest. Then I started studying—again, for 8 hours per day—for the Multistate Professional Responsibility Exam. 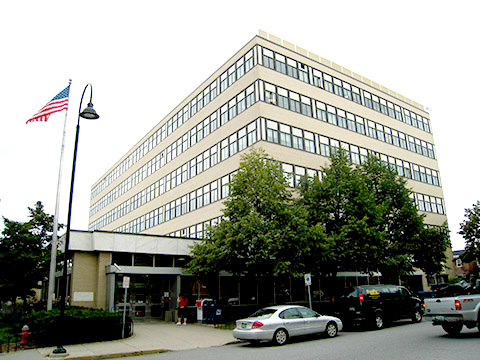 The test was held on August 5, down in South Royalton, at Vermont Law School. Finally, the studying and exams were over and I embarked upon the torture of waiting and wondering…. In the meantime, our town and school district erupted in controversy. I’ve written on this blog many times already about that controversy, so I need not repeat details here. The School Board controversy has divided some friends and neighbors and created some uncomfortably tense moments. On the other hand, there’s a positive side to the whole affair. For starters, there has been an amazing level of community involvement around this issue. In our town, like in many places, people get mad about things all the time and in most cases, they just complain. But in this instance, people did more than get mad—-they got constructive with their anger. Instead of just complaining behind each others’ backs, they spoke up and took action. There was a groundswell of local activism that frankly surprised even me. Even if it’s been difficult, our town has changed for the better. Conflict is never easy, but when handled through proper channels of local democracy and the legal system, conflict can also be inspiring and downright empowering. It’s been pretty exciting to watch as some normally very reticent and even shy people take a public stand against something they believe to be unjust and unfair. 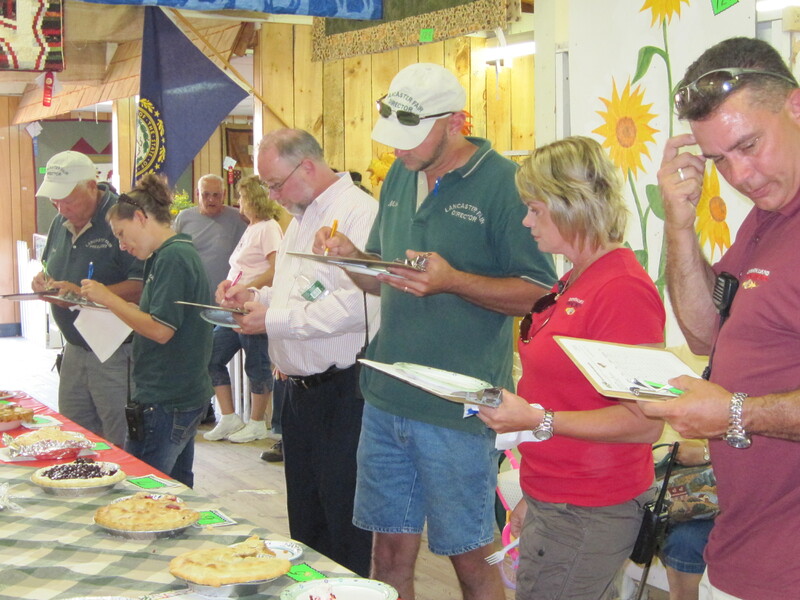 September: I entered two piemaking contests, at the Lancaster Fair. And I won second prize at the Apple Pie contest! It was very exciting! My first pie contests ever! (This later flowered into to a renewed commitment to pastry skills). On behalf of one of Dave Williams’ clients, I traveled to the Charlotte, NC area for two days to do mitigation research for an upcoming sentencing hearing. My task: to interview the client’s family members on video in order to learn more about the defendant’s childhood and background. I flew into Charlotte, NC, checked into a hotel, and then spent two full days in a rental car driving around the North Carolina countryside interviewing people and taking photos. While I’m there, I got an email informing me I passed the Professional Responsibility Exam! November: I might also call this the year that Laura got serious about pastry. I’ve been refining and working on my baking skills. 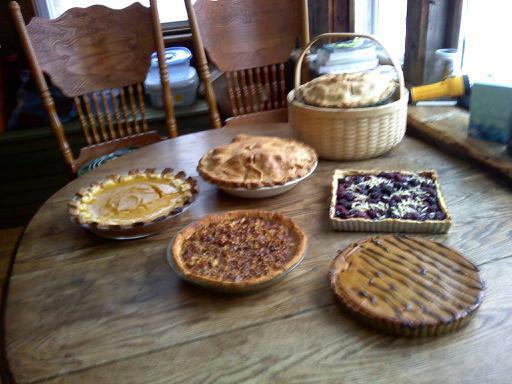 In the aftermath of the piemaking contest, I decided to do a pie extravaganza for Thanksgiving. I designed a menu of six pies, carefully chosen for diversity, the season, and the individual tastes of guests. I baked all the pies the day before, so I wasn’t rushed, and was hence super-focused on technique. Each and every one turned out great. Even the one untested project—the blackberry almond tart—was very popular. December: On December 7, I was sworn in to practice law at the Vermont Supreme Court. Amazing! Then, of course, my job search began in earnest, until the holiday break. For the first time since 2006, we spent Christmas right here in Guildhall, and we even had a tree. 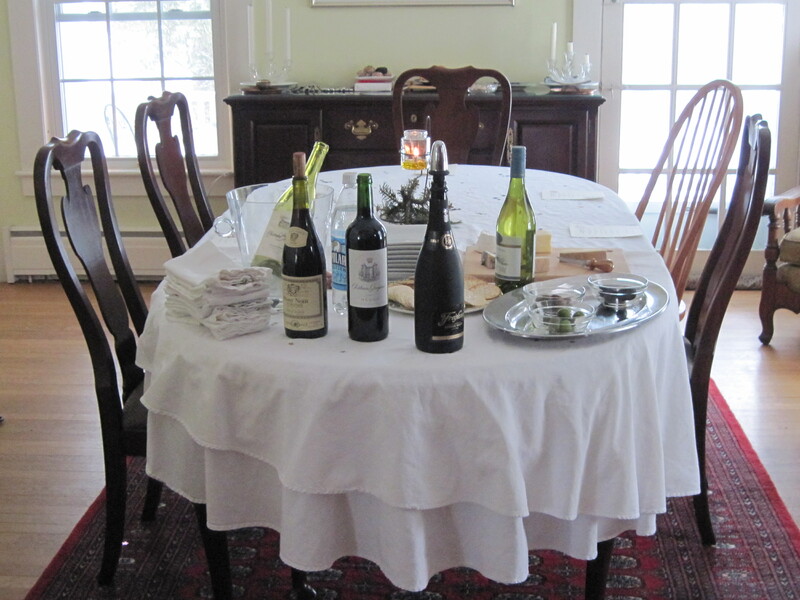 My mother and five of our Guildhall friends and neighbors came over on Christmas Eve Dinner and Christmas Day itself. On December 28, Edward and I flew from Boston to Reykjavik, Iceland, to spend New Year’s. Shortly after I passed the bar exam, we decided on a celebratory trip to Iceland. 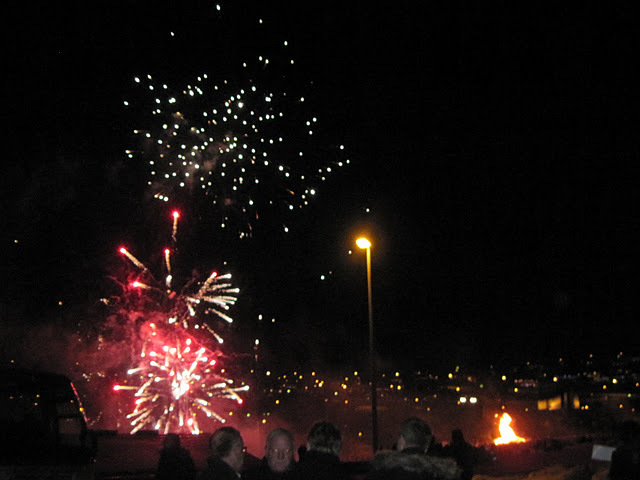 For years, we’ve wanted to spend New Year’s in Reykjavik, the hippest city on earth! The trip was short, but sweet, and just the thing we needed. We went to a museum–sometimes two–every day we were there. 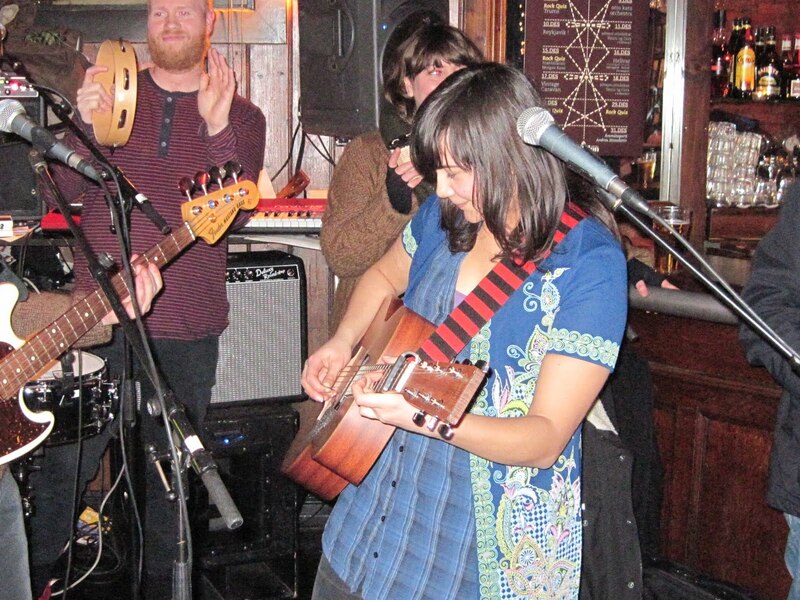 We heard great live music. We had a different kind of international cuisine every night, including at a fantastic Bulgarian restaurant. We did a lot of people watching, and in a city like Reykjavik, you never tire of it! On New Year’s Eve, we drank champagne in a glass-domed revolving restaurant overlooking the city and watched the best fireworks display I’ve ever seen anywhere. Happy New Year, to all my readers, wherever and whoever you are!